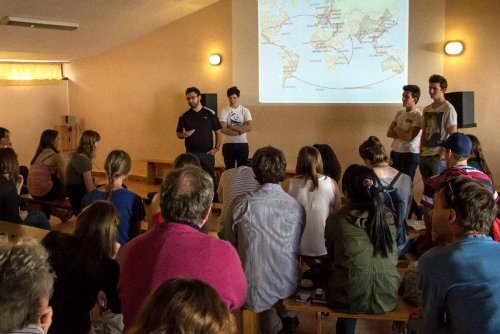 For several years now, under the impulse of its founder Samuel Grzybowski, the association “Coexister” has regularly sent groups of young people to Taizé. One particularity of the initiatives of this young association is that they always bring together young people of different religions. Radia Bakkouch, the current National President, participated in the special week for 18-35 year olds in September 2016. The community of Taizé and the Coexister association also took part together in the new initiative of the parish of Saint-Merry in Paris, the “sacred night”, which will take place again this year in the night 3 - 4 June. We were ten young people from different religions: Christian, Jewish and Muslim people. I am Jewish and I have never been to Taizé before. It was really interesting for me to know the faith of Christian people better and to live with them for a week-end. I think I found peace in Taizé. I surprised myself just gazing at the landscape and thinking how extraordinary this experience is. We made strong bonds with lots of different people there and I am thinking of going again next year.